Monotheistic Structure firstly came from Orthodox Zoroastrianism, later from Islam as Confucianism greatly shifted the role of Chinese Ancient Legends. In Iran, we can see there are Greatest Lake in the World, Northern Mountainous Area, Western Seaside Area, Eastern Desert Area, even many Marshes and Forests exist in that World. We can call Azi-Dahaka as Allegory of Evil Civilzation of Babylonians or Desert Nomad from Arabic Pennisula. First Immigrants to Persia and India were people who knew Iron Weapon and Chariots, called Aryans. They worshipped similar Vedaic Deities, we don't know whether Reformation of Zoroaster preceded or just catch up of Historical Trend of Culture...he brought some Aryan Highland Deities such as Indra to Demon Category, and brought back some Lowland Cultural Deities to his Good God Pantheon as Angels (Yazata) and customs such as Consangunous Marriage. We guess his Life circa BC 6C, but there is no proof about it. So, Indian Pantheon and Iranian Pantheon split in the some stage of Historical Timespan. Linguistically Some of Idea about Good and Evil contadicts each other for Difference of Two Cultures. Linguistically Iranians have experienced many Drastic Changes in their System. As Egyptians, Middle Age Pahlavi Iranians couldn't read Ancient Babylonian Style Cuneiforms. As Dominant Culture of Islamic Orient, Turks and Indians also used highly-Iranized Languages and Letters in their Culture. We can call names of Great Shahs of Akhaimenedian Dynasty as Cyrus and Darius as Greeks mentioned in their Scripts, but maybe Ancient Persians didn't know such names and figures, because they didn't invent History as general folks (except Deviant Herodotosian Greeks) So they held their history in the Form of Legend such as the sort of Denkard and Bundahishun. Later Hellenism and Sarasens also rushed to the Wealth of Iranian Structure and changed them. So we must distinguish Imagination and Underconsciousness from Histroical Fact, Firdausi wrote Shahname long to the Alexander Great and Sassanoid Empire, but I still don't read this part because Translators don't think them as Integral Part. Zoroastrianism to Shiite-Islamism, from Mythology to Legend, we can call his "Kai-Khosroe" as Cyrus the Great, Horned King Al-Iskandal as Alexander, but that is very superficial treatment and absurd nonsense for One of Work of Greatest Poets. 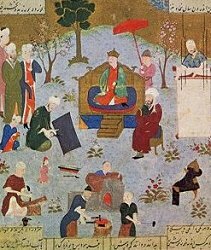 We can count some Great Iranian Poets and Authors such as Nizami, Firdausi, Omar Khayyam, Hafez, Rumi. They all have Great Personality and Indivisuality in nature. From them we can see how Ancients understood their World from their Legends and Mythology. But Extremity both to Wilderness and Decadance grows in the Border of Highlan Culture. Martial Attitude toward Civilzation sometimes takes such attitude. Sufism is Islamic Mysticism and Mysticism is generally fruit of Urbanized Society, Islamic Attitude toward City Culture and Iranian Attitude intricate in that situation. mentioned Greatest Hero as Garsharsp (Kursharspa? misspell?) but Fidausi chose Originality than Continuation and succeeded. and he and a sole daughter of Prophet cause the Split of Islamic Tradition, Problem occured in the conflict between Blood lineage and Authority. once Khosroe 2nd (Nizami wrote Beautiful Tale about Love of him and beautiful Concubine Serien) was Guest of Byzantine Emperor Maulicius for once he lost his country before the Attack of Rebellus General. They scrambled hand by hand Egypt and Syria and almost exhausted before the Attack of Arabs. Of course there is no "IF" in history, but if the two Empires could fight together to Arabs? Last Shah Yazdigerd of Sassan House petitioned to Court of Chinese Tang Dynasty before decisive Battle of Nehavend between Zorastrianism and Upstart Desert Religion, (but that is mere Hope) Princess of Last Sassanoid Empire was rumoured to wed with Husayn, son of Ali in Legend, 3rd Imam of Shiite, and their son became 4th Imam. That legend indicate how Iranians treated their Legacies as Supernatural Gift, we can only feel such perception in the Wings of their Plays. Nick Brooke induced me Historical Author Amin Maaloaf. He wrote Good Iranian Portrait and Scheme in his Work about Mani and Omar Khaiyyam. These books are Amazon com available. In Japan, some of Good Book about Persian Culture have been written. But IMHO maybe these books didn't treat enough Correspondence of Zoroasrianic Culture and Iranian Shiite Culture for some natural reason.